Remember when I said that I cleaned out my freezer the other day? Well what I found out when I re-organized it was that I had too many tomatoes in it from this summer/fall. See I put them in the freezer as the fall went on with the thought that I’d get them canned this winter. Well it’s winter and since I haven’t done a thing with them so far – I better get to it! 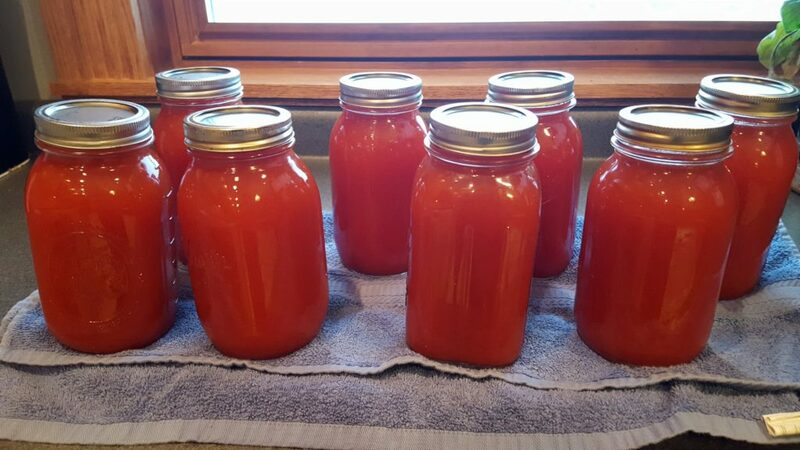 I took about half of them out of the freezer and after dragging up the canning supplies from the basement (OK it wasn’t all that bad!) I was set! My plans were to make some fresh tomato juice. So after a quick chop in the food processor, into the big kettle the tomatoes, celery, carrots, & onions went. I left it cook for some time and then I wanted to get the ‘big’ pieces out by straining it. Now this worked pretty good but I found out that I still had more seeds in it than I wanted after it was strained. So off I went to town to get some cheese cloth. I swear that the last time I needed cheese cloth I bought about 2 or 3 extra bags but I just couldn’t find them tonight for anything! Now the tomato juice went through the nice new cheese cloth and just like that it looked and tasted awesome!! Shazam! Now the best part! In less than a minute after the water bath you could hear the Ping of the jars sealing and then you just know that it was all worth it after all. Oh, that tomato juice looks so delicious!! 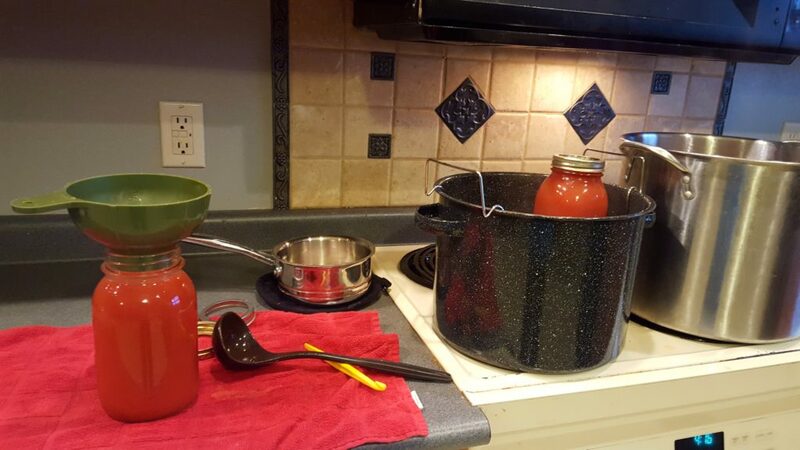 Hadn’t heard of freezing tomatoes and canning them during the winter. What a great activity for a cold winter day!